FRANK CHAMBERS today celebrates his 60th birthday safe in the knowledge by the time his next birthday comes around, he will no longer be a public representative. No more ‘councillor’. No more ‘senator’. Just simply Frank. Over half of the Newport man’s life has been dedicated to politics and Fianna Fáil. He has been elected to Mayo County Council at every election he has contested since 1979 and was also a member of the Seanad for five years. However, these political highs are tempered by two unsuccessful attempts to secure a prestigious seat in Dáil Éireann, in 2002 and 2007. Like most of those who dabble in politics for such a sustained period, he has experienced a whole gamut of emotions. His sojourn in local politics comes to an end this summer after making the decision not to contest the local elections on June 5 despite being nominated by party headquarters to defend his seat. 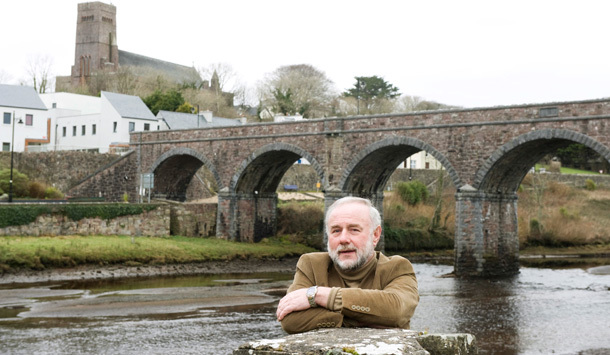 The main catalyst for his decision to retire was made by the Electoral Commission’s decision to transfer Chambers’ home base of Newport East from the Westport Electoral Area to Belmullet and divide the town in two - something he feels was motivated by selfish reasons. “It took a bit of time to settle the mind on it and come up with the decision [to retire], particularly when you have roughly 40 years involvement at one level or another. There are personal issues involved and I had to take those into account rather than just my own selfish political interests. There are times to be on the pitch and times to get off the pitch and I came to the conclusion it is my time to step off. “If anything, the decision of the Electoral Commission made up my mind for me because I was opposed to it and I made that position very clear when I wrote to the Minister threatening him with legal action. The Westport Electoral Area now comes as far as the bridge and the other end [of Newport] is served by the Belmullet Electoral Area. We have a council office here and staff will have to have separate invoices to deal with one end of the town and another set to deal with the other. It is a ridiculous situation. “What was a little alarming in the whole process was that there were submissions from people in the county and particularly elected colleagues of mine that suggested this move. I do believe it was not in the best interest of the people and I believe it was selfish and there was a certain element of motivation there,” he explained. Born and reared in Newport, Frank’s father, who was also called Frank, sadly died before he was born, so he and his sister Miriam were brought up by his mother, Nelly - who ran a very popular pub and grocery shop on George’s Street. His mother, originally from Mayo Abbey, came from a family of renowned pipers and their pub became a house of music with musicians and singers from all over the country stopping in Newport for a session. Growing up was not easy for the family but they were thankful for the support given by their loyal customers and the community at large. Although his mother was a staunch Republican, Frank admitted there was no background of politics in his family and his interest came from the discussions in the pub. After failing to get elected on his first attempt in 1974, Frank was elected in the following county council election in 1979 and has been ever present since. He is now, naturally, one of the most recognisable faces on the council. During that time he has seen many changes in local politics, from the days of canvassing outside Sunday mass to canvassing on the internet on Youtube.com. While he says that some aspects of politics have changed for the better, he feels it has become a cold business. After previous unsuccessful attempts to secure a nomination, Frank was chosen by Fianna Fáil to run in the 2002 and 2007 General Elections but suffered failure narrowly on both occasions. In 2007, he felt that Beverley Flynn was the candidate of choice for the top brass in Fianna Fáil despite the fact she was running as an Independent. The fact that Bertie Ahern did not come to Castlebar to support him on a canvass and Beverley’s subsequent acceptance back into the party fold shortly after the election confirmed this to him. However, it was the election in 2002 that still causes him most disappointment. From the beginning of the campaign he felt he had a chance of being elected. But just twelve days prior to polling, he was hospitalised after being involved in a horrendous car accident which left him and his driver and close friend, John Loftus suffering serious back injuries. Confined to a hospital bed for months afterwards, he was unable to campaign in the run-up to the election, but still polled over 5,000 votes before being eliminated. The car accident was a serious hindrance in those crucial last two weeks of campaigning but Frank also still feels aggrieved that people who were campaigning for him publicly were privately supporting other candidates. This was not the first time he felt his party colleagues let him down on certain issues and one which still angers him is the failure of the Government to go ahead with the Newport Secondary School. A site on the Glenhest road was identified and the project was going to tender before being pulled by the then Minister for Education, Noel Dempsey - at the behest of interested local parties. Despite these clashes with the party, Frank remains loyal to it and confirmed he will canvass for party colleagues in the upcoming local election. As an auctioneer he has seen at first hand how the economy has suffered and feels the Fianna Fáil candidates will suffer a backlash from the public in June. When I was lying in the field face down and looking up at the cobwebs in the grass I said, ‘Jesus, is the election going to finish here’. It was the seat I was thinking of, not my health. The vertebrae in my back were crushed. I was lucky to survive and be able to walk afterwards. When you experience something like that, you begin to realise what is important and who are the people who really care. It was a great house for music and entertainment and I used to play myself in the bar. Our kitchen was a great dancefloor. We always had a great interest in music and my mother loved to play the accordion and have a sing-song. When I got involved in politics there was a lot of banter - plenty of debate and argument. Only for Phil I certainly would not have succeeded on the political side of things. She stood with me through it all. She was extremely helpful and ran my campaigns for me. She was the solid block behind the whole thing - an extremely capable woman. I think that the upheaval that has happened in Fianna Fáil, particularly in the Castlebar area, has certainly done a terrible disservice to the party in the county. Until that is ironed out I don’t think there will be three seats for Fianna Fáil in Mayo for quite some time. It is still not straightened out and it will take time. I recognise that Bertie did appoint me to the Seanad and I was honoured with that. But in fairness he got good value for money. I gave 100 per cent…. During the period I was in the Seanad we had a county council election and got a majority with 16 seats for the first time in 40 years. Family Married to wife Phil, daughters Lisa and Sarah, sons Francis and Richard. Political career Member of Mayo County County since 1979; Cathaoirleach of Mayo County Council from 2003 to 2004; Senator from 1997 to 2002.